Yesterday was a BIG day for the Bradford family. My brother in law, Chase, got called up to the big leagues!! I was running around my house screaming like a crazy person when I found out. Chase is one of the most hard working and humble people I know. He deserves this more than anyone and I still can't believe it actually happened! Immediately we started putting plans in place to head up to LA in the afternoon for the game. The Mets just happened to be playing the Dodgers so it was perfect. We drove up to LA with some family and got to the game not too long after it started. We were able to see Chase warm up a couple times but they ended up not putting him in because they were losing going into the 9th. It was still such an incredible experience to be there to support him. We are so proud of you Chase!! This week was also exciting for me because I paid off a student loan with my Rodan+ Fields earnings!! Getting rid of debt is such a good feeling and I love that I have a way to put money aside that doesn't kill our checking or savings. When I started this business I had no idea exactly what I wanted from it. I thought a couple hundred dollars would be helpful but didn't realize that it could/ would turn into the income source it is today. So thankful to my friend Sara for introducing me to the business! A few weeks ago my friend Kylee recommended the book Caraval by Stephanie Garber. I usually don't read fantasy/ YA books but she always has the best recommendations so I immediately downloaded it. I seriously couldn't put it down, it was so good! It's a much different premise from what I normally read but it was just so intriguing. The story is about two sisters, Scarlett and Tella who dream of going to the famous Caraval and getting away from their abusive father. They don't see how they can ever leave the island but their fate is changed by an invitation to the mysterious game. This has been Scarlett's dream for so long but the game is much different that it appears and could even be deadly. I don't want to give you any more info because it will give too much away. Read this asap!! I really haven't been cooking much lately which is so weird because I LOVE to cook. It's just harder for me to get inspired when Mark isn't here. Half the fun of cooking is having someone else try your meals and love them. One thing I was craving this week though was black bean flautas. This is one of my fave meals and Mark's too! I made a batch to have for dinner a couple night and they were delicious!! Stephanie gave me this owl sign as an end of the year gift. I have an obsession with owls and she know she so well! How cute is it?? Congrats to your BIL! That's a big accomplishment. That owl sign is super cute. 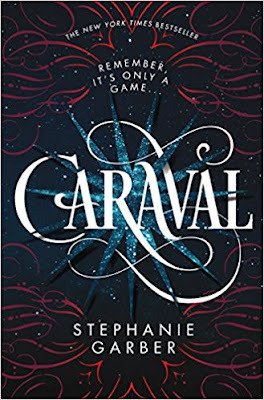 I keep hearing good things about the "Caraval" book. I'm going to have to read it sometime soon.